So you have gnomes in NZ too? Those little fellas do get around don't they? I wouldn't make homes for gnomes by an entrance because they could be trouble for visitors; you know, snatching mobile phones so they could while away the boring hours, or poking pet dogs with their fishing lines. No, I think you should clear the sorry looking mess you have there and grow something more suitable. 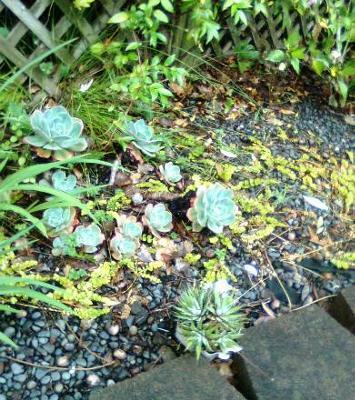 Give those nice succulents (how hard is it for you to do a spell check over there in Orkland, NZ?) a spot in a sunny patch, and go along to your garden center, ask the experts and buy some lovely semi-shade loving low bushes or rockery plants. If you select carefully, you can have flowers all year round. Your idea of ornamental cabbages is terrific, right on!. From very early spring on they come in colors white, green, purple and pink, but you do have to replace then when their showiness is finished. What about other colorful vegetables like red and yellow stemmed chard and purple cabbage, purple broccoli, red and lime green lettuces? This way you can have some veg for yourself and give a bunch to your visitors who admire them as they come through your entranceway! These leafy sorts don't need so much sun as other veg. It would be good if you could grow eye-catching cherry tomatoes and red chilies, even ornamental chilies, but these need lots of sun and you say your excuse for a garden gets shade from an oak tree at the moment. Any chance of lopping off some of this tree if it's in your place? Here in Dallas we can legally remove any growth on our side of the boundary, not sure about Orkland. You don't mean Oakland do you? Send in a photo when you're done. Happy gardening, Cherri. I would look at planting a hosta in that spot; the shade would provide the perfect environment, and the lush foliage would look great there. A number of hostas have beautifully fragrant flower spikes which is a nice touch for an entrance way.